Each day this summer, Red Cloud graduate Jazzlyn Weston ’16 watched the sun rise and set around the Crazy Horse Memorial’s rocky mountain peak. Out her window and high above her, she could see the carved face of the revered tribal leader gazing out into the Black Hills, a deeply sacred place to the Lakota people. 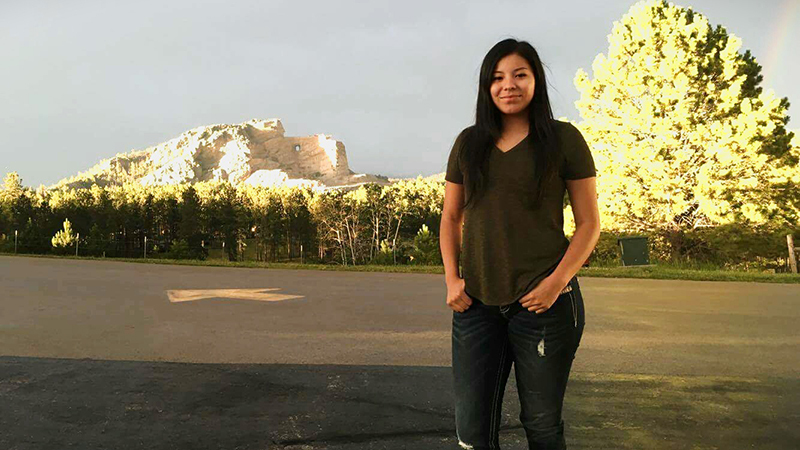 As a participant in the unique summer program operated in partnership by the Crazy Horse Memorial Foundation and the University of South Dakota, Jazzlyn had the chance to study, work and live for eight weeks beside the mountain memorial. And each day, it continued to take her breath away. “Just being here and living next to the world’s largest rock sculpture—it was like magic,” said Jazzlyn. In the midst of her last year at Red Cloud, Jazzlyn decided to apply to the program—called the Indian University of North America® —in order to prepare herself for the challenges of college and career. The summer program at Crazy Horse has two distinct components: over eight weeks, participants complete college-level, accelerated courses while also taking part in a paid internship at the Memorial’s museum and cultural center. By the end of the summer, they earn credits for the equivalent of a full university semester as well as valuable work experience for the future. For Jazzlyn, that combination proved to be a powerful experience. For her internship, Jazzlyn trained to be a tour guide and led people from all over the world through the monument’s museum and cultural center. “I was initially interested in this program because of the internship—there aren’t many job opportunities on the Pine Ridge Reservation, and I thought it would be good to add some work experience to my resume before going to college,” she explained. The program’s strong cultural component was another draw for Jazzlyn. Native history and culture was integrated into all of her coursework. And as part of her Native studies course, she attended weekly presentations featuring accomplished Native Americans from across the continent. Looking back at the program, Jazzlyn recognizes how much it helped her identify what she does—and doesn’t—want to focus on in the next phase of her education. She says she enjoyed studying psychology, but probably won’t pursue it as a major as she once thought she might. And while she has always enjoyed English classes, after drafting longer and more complex essays this summer, she has discovered a new passion for composition and writing. Jazzlyn is now preparing to head off to college as the summer winds down. But regardless of what direction she takes in her education, she says her time at Crazy Horse will continue to inspire her in the years to come.